Despite heavy overnight rain Tog will be pleased no campers had to decamp into the clubhouse! The early morning started with another good southerly but it didn’t last, disappeared, swung round, and round, then finally settled from the west. A delayed start meant the race was sailed in a swinging but decent breeze which continued, and strengthened, throughout the afternoon. The windier conditions led to some interesting events on the start line. A RS300’s mast broke just after starting but, with the 2 min starting sequence, was unable to be cleared from the line before the F15 start, so it was postponed at the last moment. Other boats capsized in the area, causing some confusion amongst starting boats of other fleets. The delayed starting sequence meant that the lead fast handicap boats were coming through the course adjacent to the starting line, but through the boats still mingling to start. There were numerous capsizes, gear failures, and retirements throughout the race but all enjoyed some great sailing. 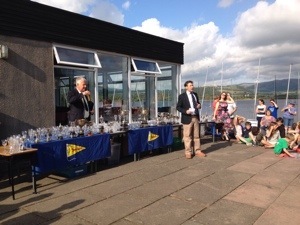 The second prize giving of the week was held after racing, with 5 races/series to award over 11 fleets it was going to take some time! After evening barbecues, there was a disco waiting for all to dance off any excess energy they may have!